Another charming example of the lighthearted style of German, Biedermeier painter Carl Spitzweg (1808-1885). 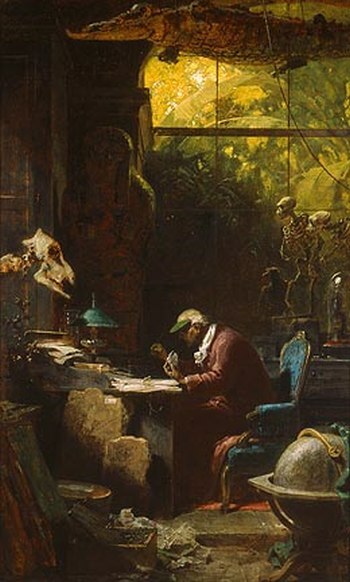 This painting shows a room cluttered with what appear to be archeological finds from around the world surrounding a scholar examining yet another artifact. What first drew my eye in this painting is the pair of skeletons and what appears to be a small primate in the background of the piece. The trio look as if they are quietly slipping out of a rain-forest and perhaps escaping the naturalist’s lair. An Egyptian sarcophagus is pushed in a corner, yet somehow appears to be standing guard over the scholar, perhaps ready to protect him from the skeletal remains of what might be that of a small dinosaur. There’s just so very much to look at in all of Spitzweg’s paintings, and this one is no exception. Unfortunately, the original picture I found of The Scholar of Natural Resources was fairly small and what you see here was slightly enlarged to better see the numerous details included in the painting. Spitzweg is known for his humorous depictions of life and this painting is no exception. To learn more about the artist and view other selected works, please visit our Carl Spitzweg biography.